The Achievement Cigar Company has a distinguished reputation for being a first-grade producer of vintage and rare cigars. Founded in 1952 by José Aray Marin in Ecuador, it now has three brands: the traditional and sophisticated Don Cervantes; the modern, cutting-edge PROPIO; and the rare, matured La Viña. All ACC cigars range in taste and style from seven-year aged Dominican blended tobaccos, Ecuadorian eight-to-ten year aged tobaccos, or late 1980s Vintage Ecuadorian Puros − 12-year aged and triple fermented. It also specialises in vintage Cubans and limited release cigars. La Viña, the most notable, has a smooth, sweet, rich blend from the oldest Ecuadorian leaf. Pulled from the vast stores of old leaf which has been held aside especially for this cigar, ACC has created a masterwork of earthy chocolate flavours that leaves you feeling satisfied, yet never overpowered – it’s just a shame that its annual production is so limited. A connoisseur-turned-businessman, Felipe Gregorio created his company in 1988 out of his love for Cuban cigars. Initially learning his trade in Honduras through the tutelage of Don Jorge Buesos and Don Julio Eiroa, he moved to Nicaragua and founded a factory under the guidance of Omar Ortex. It is here that he still grows all of his wrappers, binders and fillers. Celebrating his 15th anniversary with a premium cigar like nothing the market has ever seen, the Felipe Power features an exclusive Costa Rican wrapper and is from ancestral Pelo de oro Cuban Seed. This seed has not been available anywhere − not even Cuba − since before Castro seized power, turning the clock back 50 years to Cuba’s Golden Age of cigars. J. Cortès has a rich heritage, dating back to 1924, when founder Maurits Vandermarliere set up his small tobacconist in the village of Moen, North Belgium. In 1926 he brought out an old cigar factory and created his first 60,000 cigars and from there the brand became unstoppable. The long filler Dominicans featured here are hand-made with a carefully selected shade-grown wrapper from Ecuador. The blend of choice is Brazilian Mata Fina with Dominican and Nicaraguan Cuban seed tobaccos which provide aromatic full-bodied flavours. Brun de Ré is a company derived from rescuing the origins and values of a family descending from European royalty. With roots now settled in Costa Rica, the company has established the highly successful store “Mundo de lose Puros” and its ambient Cigar Lounge. The Premium cigar from Brun Del Ré is ideal for morning smokers, thanks to its exquisite taste and soft draw. They are one-hundred percent handmade, releasing a smooth taste and great flavour. The filler is made from Nicaragua tobacco, the binder is from Indonesia and the wrapper is from Connecticut. Dating back to the 19th century, the Fuente family’s roots in tobacco go back to founder Arturo Fuente’s days in Cuba, where he learnt the art of cultivating top-quality tobacco from his father. After immigrating to the US he rolled his first cigar in Tampa, Florida, but the family still has strong ties to the distinguished network of tobacco-growing countries. Nestled in the rich, volcanic soil of the Dominican Republic lies Chateau de la Fuente, home to the coveted Fuente Fuente Opus X. 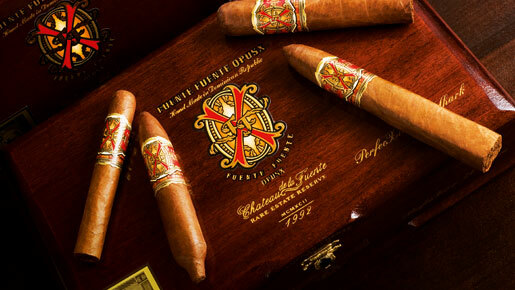 The mineral-rich soils of the Dominican Republic had never met with the expertise of the Fuente family, but together they cultivated a glorious wrapper tobacco that became the foundation for the Fuente Fuente OpusX, the first ever Dominican Puro. Today, the cigar is regarded as the pinnacle of cigar perfection and the standard by which all cigars are measured. The unique combination of Fuente tobaccos produce flavours both smooth and bold, in harmony with the sweet lingering fullness of the exclusive wrapper tobacco.